That’s the top topic voted by blog readers, so here’s my take. 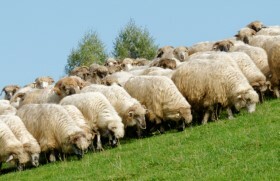 It’s sheep-dip training. Everyone must be “exposed” to it, and a checkmark records that they have been exposed. How can we make it more relevant? A client who says “Everyone must be trained on X” needs our resistance, not our obedience. What problems are you seeing? Has something happened? Has someone sued? Was this problem caused by one rogue employee, or is it a bigger issue? Is it limited to a group of employees, or is it really a problem that all employees are causing equally? If there’s really no problem, we shouldn’t create a solution. We need to focus on improving performance, not guarding against problems that experience has shown aren’t likely to occur. If it’s clear there really is a need for “training,” or some force far outside your control insists on “training,” then put on your action mapping hat and push for a measurable goal. Here’s one model to follow. For details, see How to create a training goal in 2 quick steps. Make sure your audience is specific. “All employees” is not specific. If you’re required by forces beyond your control to create something for all employees, you can at least break down the audience by major job roles as described next. 4. Do the analysis. Really. DON’T SKIP THIS. Focus on one job role in your audience. Ask your client and SME what these people need to do, in specific, observable terms, to meet the goal. When you must physically transfer data to another location, put the data on a BrandZ thumb drive using HakrPruf encryption and chain it to your left ankle. Prioritize the actions. Choose a high-priority one, and ask, “What makes this one thing hard to do?” Use the flowchart. Again, you’re doing this for a specific group of people in a specific job, and you’re focusing on specific, observable behaviors. You’re not asking this once for the entire “course,” and you’re not talking about all employees in every job everywhere. If those forces far beyond your control insist on applying the same solution to everyone, do this analysis for the major job roles. You probably won’t have a ton of time to do this, but even two hours can save you and everyone else from a much bigger waste of time in the form of irrelevant and ignored materials. Then, if training is part of the solution, you can have people use only the activities that apply to their job. If you skip this analysis, what do you have to work with? Generic rules that are guaranteed to become an information dump. Yes, people need to know stuff. But they need to know stuff in order to do stuff. Design first for what they need to do. Provide the need-to-know information in the format it’s used on the job. Let people pull the information just like they will on the job. Here’s a fictional example. Extraterrestrials have landed and are being incorporated into earthling families. 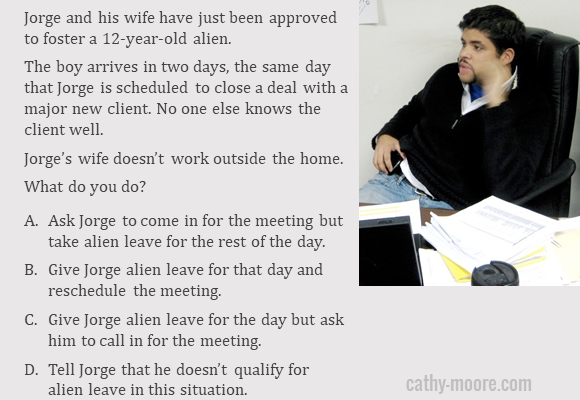 As a result, employers have created alien leave policies. Here’s a mini-scenario for managers. To answer this question, what information does the manager need? The alien leave policy. How should we provide it? The traditional approach would be to first present a bunch of slides about the policy. Then we’d give people a chance to “apply” what they’ve “learned” by having them use their short-term memory to answer the question. But why design slides to present information that’s already in a policy on the intranet? Instead, we can plunge people into the activity and let them use the policy just like they will on the job. And now that we aren’t developing lots of information slides, we can create more activities. Since they aren’t trapped inside an information presentation, they can travel alone. For example, we can provide them individually over time (spaced practice) as described in this post. Create a prototype of one typical activity and show it to the stakeholders. Make clear that people will see only the activities that apply to their job. They’ll pull information rather than recognizing what they saw three slides ago, and they’ll learn from the consequences of their choices. You’re letting the stakeholders see for themselves how you plan to provide the “training,” because then you’ll be in a good position to respond to the following common concerns. Give each option unique feedback. In that feedback, first show the consequence of the choice — continue the story. Then show the snippet of information they should have looked at, as described in How to really involve learners. Do this for all consequences, not just the poor ones. See more ideas and examples in Scenario mistakes to avoid: Eager-beaver feedback. If you have a stakeholder who’s determined to expose everyone, you can point out that they are now exposed. They’re just exposed after making a relevant decision, rather than in a forgettable presentation. By not presenting information first, you’re helping people see their own knowledge gaps. They’re not pulling stuff out of short-term memory, because you haven’t put anything there. They have to rummage around in their existing knowledge, look at the policy just like they would in real life, make a choice, and learn from the consequences. They get deeper learning, plus they’re dutifully “exposed” to the correct information. 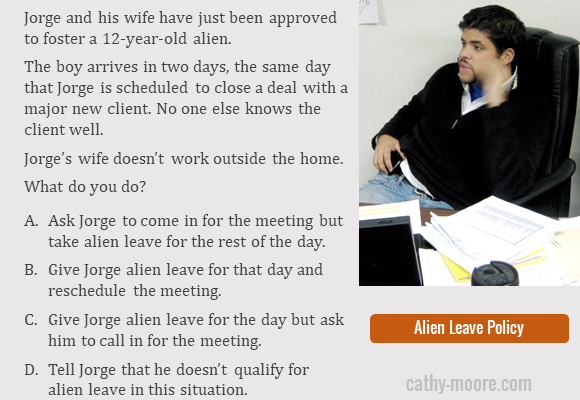 Which approach is more likely to avoid lawsuits about misuse of the alien leave policy? A. Present the policy over several slides. Then require a knowledge test to see if people can recognize a bit of information that they saw 5 minutes ago. If they can, they “pass.” If they can’t, they must put those same slides back in their short-term memory and try again. B. Present challenges in which people need to make the same decisions they make on the job. 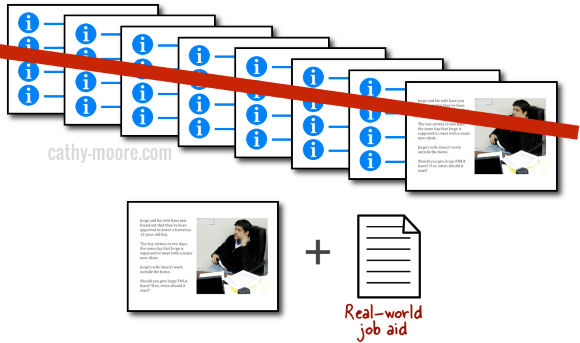 Provide the information in the same format that people will have it on the job. Start with easy-ish decisions and increase the challenge. If people make good decisions in enough activities, they’re free to go. If they make not-good decisions, they get more activities and optional help until they make good decisions. For lots more, see my book and just about everything in this blog, especially the following posts. Will action mapping work for my project? Custom advice for your situation. Any tips for regulated compliance training-for example we have to show for OSHA or ISO standards that we have taught every single employee the information, but beyond that we have to show that we covered every detail of our policies, etc with our employees-which I hate, but if I can’t prove that every employee had to read through every word of the policy/standard and then was tested we can get a corrective action from ISO or OSHA. I hate to do the locked down click, read, quiz format so I’ve been trying to drop them into a scenario with the job aids like described, then tacking the click, read, quiz, on the end – but it still feels so wrong from an ID perspective to engage them then loose them at the end with the typical info dump and test. Any tips for when you’re caught between good learning design and an auditor going ‘prove it’? Hi Maggie, could you use the technique described in the post and just make sure to track that people have done each activity? Like you, I don’t see the need for a separate knowledge assessment. In other words: The learner is asked to make a realistic decision that requires knowledge of X. They can look or not look at the policy about X before making the decision — it’s optional. They make the decision. They see the consequence of their decision (the story continues) AND they see a snippet from the policy that covers X. They can’t avoid seeing this snippet. The LMS dutifully notes that they have now been exposed to the policy bit about X. If they got there by making the right decision, the LMS also notes that they “know” X, and the learner goes on to different activities. No knowledge test required because the learner has shown that not only are they aware of X, they can use it to make good decisions. If the learner made a poor decision, they are required to do more activities about X until they get them right. I don’t see mandatory training as ‘Follow these rules’. If you look at something like DSE (Display Screen Equipment) training, it’s much more about making people aware of the hazards, how they can avoid them, and what they should/could do if they think something is wrong. It doesn’t matter whether someone in the organisation has had a problem, or the records show there is a problem within the organisation, there are national statistics to show how many people suffer from this work. If you look back a year or so and asked the questions: What problems are you seeing? Has something happened? Has someone sued? in terms of sexual harassment in the workplace, the answers may have been ‘none/no’. We know now that there were problems – but they weren’t being reported, or if they were they weren’t being taken seriously. We take this view. A lot of mandatory training is very relevant to our personal lives. In Europe we’ve recently changed our Data Protection laws. Pretty much everybody who handles personal data is supposed to understand the basics – obviously there are others who need much more training/understanding. Data Protection has been in the news recently with Facebook and Cambridge Analytica etc. It’s the same rules and people are interested in them. We want to know what companies can and can’t do with our data, what rights we have and so on. (You can see our video here https://youtu.be/jwFoMe5vE-o) So our videos draw the connections between the ‘rules’ and our personal lives – you’re probably more interested your data privacy than you are someone else’s. sometimes it is more of a personal choice. even though some organizations offer mandatory training for its employees, sometimes you find those who are not interested. the important part is to try and change the perception of them and create an innovative way of making them believe that it is good for them. Great post! Thank you for it. Unfortunately, in healthcare, surveyors are only concerned with the completion checks. Luckily, that keeps me in business. But you gave some really good tips for creating this training in a manner that achieves outcomes instead of just checks. I love the idea of creating an issue/problem, providing resources and then asking for the solution, instead of just having them read the resources. Thanks! Excellent ideas! I am in similar situation to Lu Post, as I work in the pharmaceutical industry training clinical trial teams. Many of our check-box courses can be taken repeatedly until the learned achieves a minimal score, which is not learning. I look forward to adding decision making points on relevant topics to improve the experience. The analysis part is something that gets overlooked due to internal pressures. And compliance training falls into this trap more often because there is someone who already “knows” what needs to be taught and that “all employees” need this. The tough part is pushing back on the project sponsor to make sure that the training is focused and has a chance to be successful. This is a great post and one which I think I will refer back to several times. I know for many people recently training on data privacy and the impact of GPDR. I can’t echo the need need to make the training relatable and specific to an outcome(s) enough. Especially in the case of data privacy, it all seems very cut and dry in the bullet points, but it is only when you see cases and have to apply what you have learned or check you can actually find and utilise the information and processes you will need in such a scenario that can feel confident as the learner/user, in turn giving confidence to the client/boss(es) that your company is well placed and engaged. I think the issue is often that the training is delivered using the lens of the company or subject matter expert ‘telling’ the employee what to do and can seem autocratic. If you design your mandatory training through the lens of the end user, using credible examples and delivering it from their point of view, it makes the course more palatable. How do you do this? Well, get some potential end users to give you feedback, advice, input into what their real issues are, what their challenges are and incorporate that into the training. Clive made a great point. Training should be designed for the end user. I don’t have much experience with designing curriculum as an instructional designer. However, I have facilitated my share of face-to-face professional development trainings. When designing those trainings, I try to consider the participates and their needs while also considering the information that must be presented. One of my biggest takeaways from your post is the idea of applying the knowledge. Throughout the school year, I am tasked with presented a lot of information that would be more easily digested if presented in a scenario. I like the idea of real-world scenarios. As I move forward on future presentations, I plan to incorporate more scenarios. The desired outcome that I would look for is whether the employee can effectively apply the knowledge learned. This post was extremely informative and will be saved for future reference. Great post! This is great information to know about how to make training more relevant. I am new to the field of Instructional Design and am learning more about how to approach training and development in an organizational setting. In the initial step you mention to “disobey” and work with the client to distinguish between the need for training versus improving performance. In your experience, have you received resistance to asking the questions and having a client be adamant that the problem is training when after we evaluated it is essentially performance issue? Do you have any suggestions? Hi Amela, basically, the designer needs to use consultative skills to persuade the client that (1) it’s worthwhile to analyze the problem and identify all solutions and (2) designers are capable of analyzing and solving a performance problem and not just cranking out training on demand. This requires a lot of skills. I cover it in depth in my book. Very briefly, it helps to position ourselves as problem solvers, not course creators, so clients come to us with accurate expectations. It’s also necessary to include the client in setting the goal and analyzing the problem, so they see for themselves that the problem has many solutions. This blog post is a fascinating read, Cathy. I work in a human resource department and currently taking classes to obtain an instructional design certificate. Being able to create content that is relevant to employees is essential for increased job performance and engagement. In recent years there has been an increase of employees teleworking, and I suspect that employers will continue to include teleworking as a company benefit. Do you have recommendations for presenting and engaging a group of employees that virtually work for a company? Being able to work remotely has its advantages, but it also takes away face to face communication and learning. I appreciate your suggestions to provide training that is focused on the “do” employees are being asked and expected to complete. I work in K-12 education and provide professional development to adult learners in my district. One of the challenges I have experienced training adult learners who work across 39 different school sites, is that they all experience very different work environments. They might have the knowledge and skills to do their jobs (as you mentioned in your awareness blog post from 2012), but work in unsupportive or cultures that don’t align with the school district’s philosophy. What are some strategies for providing meaningful professional development to employees who have the same job classification but different supervisors and work environments? Since you mention unsupportive supervisors and cultures, you might want to take your client through the “Will training help?” flowchart. This might help the district see the local problems more clearly and identify ways to address them or to at least develop additional materials help teachers deal with them. "It's new, so everyone needs training on it." Nope.